Hi there! Today it’s my great pleasure to review a book for a good friend and fellow critique partner: Kym Brunner. I’ve known Kym for four years–so I had some sneak peeks into her debut novel, WANTED: DEAD OR IN LOVE, as it was being conceived. Impulsive high school senior Monroe Baker is on probation for a recent crime, but strives to stay out of trouble by working as a flapper at her father’s Roaring 20’s dinner show theater. When she cuts herself on one of the spent bullets from her father’s gangster memorabilia collection, she unwittingly awakens Bonnie Parker’s spirit, who begins speaking to Monroe from inside her head. Later that evening, Monroe shows the slugs to Jack, a boy she meets at a party. He unknowingly becomes infected by Clyde, who soon commits a crime using Jack’s body. The teens learn that they have less than twenty-four hours to ditch the criminals or they’ll share their bodies with the deadly outlaws indefinitely. This contemporary YA romance is tension-packed. Monroe is a troubled high school senior. Her mother died just over a year ago and she’s having issues with impulsive behavior. She’s got two strikes–one for shoplifting and one for vandalism–any more run-in’s and she’ll break probation and go to jail. Oh, and she can kiss her scholarship to NYU Buh-Bye. Though she knows better, Monroe can’t resist touching the newest piece of memorabilia her father has collected for his Gangster Gallery–spent slugs that were used to gun down notorious killers and lovers Clyde Barrow and Bonnie Parker. Who could have guessed doing so would rouse these two spirits from the Great Beyond. Unable to return the slugs immediately, Monroe takes them along to a party intending to return them the next morning when her dad isn’t watching. Meeting Jack Hale at the party sets the plot into motion. Monroe doesn’t feel a connection to the cute boy, but he’s so attentive she can’t help chat with him about the slugs. Touching them allows Clyde’s spirit access to Jack, while Bonnie’s spirit inhabits Monroe. Neither Jack nor Monroe really understands what has happened, at first. Monroe starts hearing a voice in her head, and any time she touches the slugs or other personal effects of Bonnie Parker she goes into a trance–seeing Bonnie’s memories as if they were her own. Yeah, Monroe’s losing it. Aided by the Half-Dead Society, Monroe and Jack learn that their only hope to ridding their bodies of Bonnie and Clyde’s spirits is to complete their final wish and lay them to rest–together this time–on the anniversary of their deaths. Big problem? That anniversary is twenty hours away. Bigger problem? Their eternal resting place is in Gibsland, Louisiana, and Monroe and Jack are in Chicago–a 16 hour drive. Biggest problem? The cops are on their heels and they just impounded Jack’s car. Monroe is all for rushing off on the trip south, but Jack’s sure Monroe’s plan is cracked. He wants to turn himself in–perhaps get off easy for it being “his” first offense. This is something neither Monroe nor Clyde will accept–Monroe can’t become a three-time offender and Clyde had, and will, kill to stay away from ‘the laws’. The story unfolds in alternating point-of-view–with Monroe and Clyde telling their parts. Clyde’s a bit swept away by the feisty Monroe, and as they drive toward the deadline he attempts to determine which woman he’d want to spend his ‘new’ life with: Bonnie, or Monroe. Still, it’s only a hunch that the spirits can be laid to rest, and Clyde’s itching to take Jack’s body over–for good. Nonetheless, Monroe and Clyde can’t avoid chatting on the trip, and Monroe finally feels a connection to someone–shame it’s a long-dead killer. Throughout the journey, Jack and Clyde alternate possession of Jack’s body–and Bonnie’s jealousy and hurt over Clyde’s infatuation with Monroe leads her to cause Monroe some grave discomfort. I adored the realistic setting, even in the face of the potent magical elements. More than just laying Bonnie to rest, Monroe wants to stop running from all her troubles. She recognizes her troubles result from her own impulsive behavior and wants to do the right thing. Part of that is rescuing Jack, even if it means sacrificing Clyde. Like any getaway road trip, there are almost more obstacles than they can overcome. The pace is fast and the stakes are high: only two spirits might remain past the deadline, and Clyde’s desperate to be one of them. When the resolution comes the ending is satisfying, while leaving the door open for another tale. Interested? The ebook for WANTED: DEAD OR IN LOVE goes on sale in late May, but the hardcover can be pre-ordered through Amazon and Barnes & Noble. I received a review copy of this book via NetGalley. Kym Brunner’s a lifelong Chicagoan. She teaches middle school reading and has been writing for more than ten years. She’s a member of SCBWI and a mentor to many writers in both in-person and online writer’s critique groups. She’s addicted to reality TV, and reads books across all genres. You can find Kym on her blog, twitter and Facebook. Wanted: Dead or in Love is her first novel, but she has a second (unrelated) book, ONE SMART COOKIE, coming out this July. 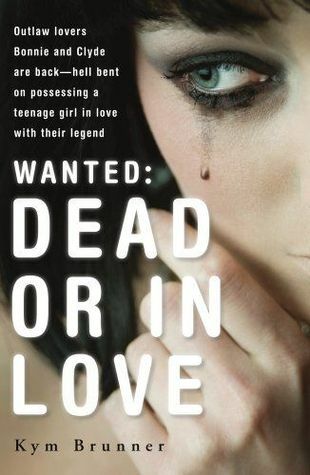 Kym is giving away two paperback copies of WANTED: DEAD OR IN LOVE via Goodreads. It’s a great book and a thrilling read. Hope your launch is fantastic!